Boil eggs, remove the shell. Make small scars on the eggs with a knife. Heat a table spoon of oil in a pan. Fry the boiled eggs to golden color and keep aside. Heat oil in a pan and add jeera, cloves and cinnamon. When jeera starts spluttering add the chopped onions, green chillies. Fry until the onions become translucent. Now add the ginger garlic paste. Fry for few seconds and add red chilli powder, dhaniya powder, haldi and salt. Mix well and add the green peas to it. Sprinkle little water, close the lid and cook for 5 to 8 mins in a medium flame. When the peas are cooked add the boiled and fried eggs. Add the garam masala and mix well. 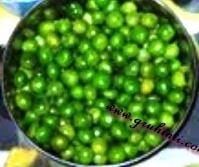 Switch off the flame after few mins and take the Green Peas Eggs Masala curry into a bowl. Garnish with finely chopped coriander leaves and serve with Rice, Rotis or Chapatis.